Many thanks to all those who contributed to and/or hyped the open house last Saturday. The event was a big success thanks to all your efforts. It’s the final week before break! 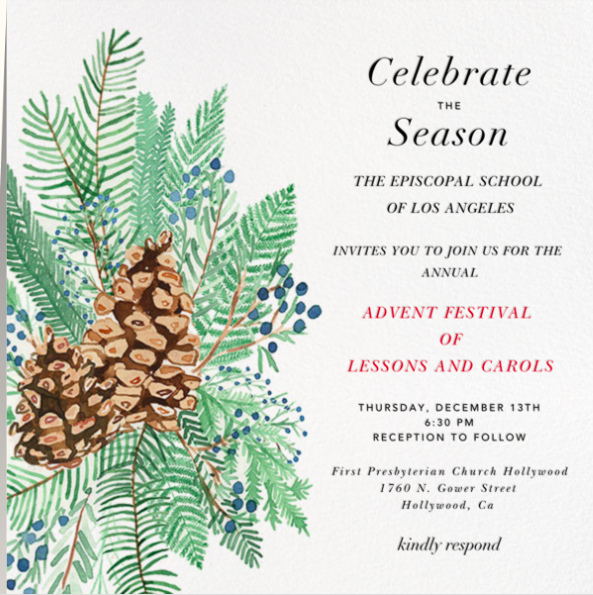 See you all at Lessons and Carols this Thursday. Lessons and Carols is THIS THURSDAY, December 13, 6:30 p.m., at the First Pres Sanctuary. This Friday, December 14, is a HALF DAY. Students are dismissed at 11:20 a.m.
On exam days, students need to arrive by 9:50 a.m. Attendance will be taken in homeroom. Exams begin promptly after CAC block (around 10:30). Students have up to two hours after the start time to take each exam (students with accommodations have exceptions). After students turn in their exams, they are permitted to leave campus. Students are welcome to stay on campus for lunch and the afternoon to study if needed. The Middle School continues with a regular schedule. The schedule for exams is as follows: Monday, December 10 - Language Exams; Tuesday, December 11 - Math Exams; Wednesday, December 12 - History Exams; Thursday, December 13 - Science Exams. Friday, December 14 is a half day; school runs from 8:30 - 11:20 a.m. This day also serves as a make-up exam day for students who missed the original test date. Contact Janie Hannon at registrar@es-la.com with any questions. The Festival of Lessons and Carols is THIS THURSDAY, December 13, 6:30 p.m. in the Sanctuary at First Presbyterian. This is one of ESLA’s major school feasts! All students are required to attend in formal dress. All families are invited and encouraged to attend. Everyone should have received a Paperless Post invitation. Please RSVP! ESLA's Annual Fund drive has officially kicked off! Please support this very important campaign which benefits students and programs throughout the year. Contributions to the Annual Fund are directed to the school's highest priorities. Our goal is 100% participation for all members of our community: parents, trustees, faculty and staff, and alumni. You can make a gift online at www.es-la.com/support, mail in the gift envelope you received last week, or contact Marcia Berman in the Development Office at berman@es-la.com. Solicitando ayuda financiera para el próximo año académico. Or if you prefer to leave cash, please put it in an envelope for attention: Lucy Norland and leave it at the school front office. There is no suggested donation amount. No contribution is too great or too small. This collection is entirely parent-led, and separate from the Annual Fund. Mother of Jack, 9th grade. ESLA’s first Talent Show will be held Wednesday, January 23, 4:00 - 6:00 p.m.! Sign ups will take place the first week back from Winter Break. Students in grades 6-12 are welcome and encouraged to prepare an act. All acts must be under five minutes in length and complete the approval process.